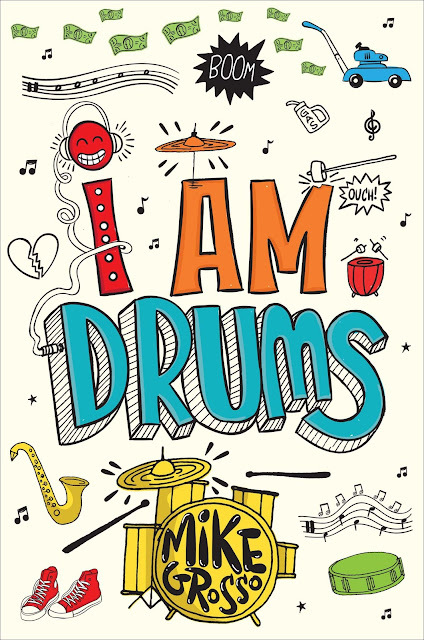 Today on Kidliterati, we have a first for us and a second for middle grade author Mike Grosso and his debut, I AM DRUMS: a NEW cover reveal! Read through to hear all about Mike's publishing journey, and don't miss the Rafflecopter giveaway for this charming middle grade coming September 6, 2016 from Clarion Books. A middle grade debut about dreams, dilemmas, and drums that will resonate with readers trying to keep their ambitions alive during tough times. Sam knows she wants to be a drummer. What she doesn’t know is how she could ever afford a drum kit, or why budget cuts end her school’s music program, or why her parents argue so much these days, or even how to explain her dream to other people. An exciting new voice in contemporary middle grade, Mike Grosso creates a determined heroine readers will readily identify with and root for. We agree--kids need the freedom to chase their dreams. Without further ado, here's the cover reveal!